My guess is one of the speakers was unable to make it and so it became a more general discussion surrounding conflict, suffering and cultivating a practice to help with that. The moderator was late, having gone for a hike in the woods and found herself lost. But the Buddhist monk, Matthieu Ricard, director of the Karuna-Shechen a non-profit headquartered in Kathmandu, Nepal, who in France anyway has been given the label of – happiest man on earth – questioned that title, suggesting perhaps this was a difficult thing to test for, given the world’s current population of over 6 billion people. It was a perfectly pleasant way to spend an hour of one’s morning, especially if one had come to Aspen specifically for the Ideas Festival and didn’t have any expectations. Certainly there is much to be said about cultivating compassion and putting oneself at the service of others. Just talk to any parent of a child with autism. What bothers me about all of this is the lack of conversation, the reluctance to feature autism as a worthy topic. It is something I see all the time. The people, like myself who are talking about it, are doing so because we are parents of children with autism. Perhaps it’s seen as a downer, after all there’s no cure, we don’t know the cause, so let’s just not discuss it, let’s not have any conversations about it, let’s not even bring it up. Maybe it’ll go away if we ignore it enough. It’s got to be such a drag listening to someone who goes on about autism, the statistics, news stories about the rampant abuse of autistic people, it’s intractable nature, blah, blah, blah. Why can’t I talk about something more cheerful? And here’s the thing – actually I can. In fact most of the parents with children with autism can. 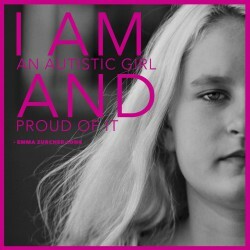 We parents of autistic children have found ourselves elated by a word, a single word coming from the mouth of our child. It doesn’t take much for us to feel joy. Our child can hug us and that lone hug is something we remember as though we had received the Nobel Prize. Maybe, just maybe, we don’t know the cause, we don’t know the best way to treat it, because autism isn’t viewed with the same sort of panic the avian flu received or mad cow disease or any of a number of topics which swept all of us up in a frenzy of terror. According to the CDC at least 1% of our population has been diagnosed with autism. That’s over 60,000,000 autistic people world wide. 60 MILLION! And yet, autism, gets a big yawn. So here’s an idea, let’s keep ignoring it, let’s all agree not to discuss autism, because what’s the point really? By the way, just in case anyone’s wondering, I’m the mother of a beautiful little girl who’s Great-grandfather began the Aspen Institute and who’s hope for the future gets dimmer by the second. This entry was posted in Aspen Ideas Festival, Autism, Parenting and tagged abuse, Aspen, Aspen Ideas Festival, Aspen Institute, Autism, autism children, autism statistics, autistic, autistic children, HINI flu, Parenting. Bookmark the permalink. Why do we neuro-typicals persist in only viewing autism as an uncomfortable or unfortunate “other” without considering what WE ourselves might be missing? Is there not a TON that we can learn from Emma herself, from her apparently joyful experience of the gift of life? And why is that the “too close to the subject” journalism didn’t seem to apply when Katie Couric televised her own colonoscopy after her husband died? Or when John Stossel talks about his early battles with stuttering? Why do we lack the imagination to consider if there are things about life that Emma and others like her with autism understand and know, that we don’t? Sometimes I think this situation is like the blind man and the elephant. The elephant is life, in all its power and glory and variety. And we are the blind man, holding firm to the tail with both hands and vociferously insisting that it is obvious that an elephant is thin and wiry, like a length of rope. And we never reach our hands out beyond to find what is really there because we already have the answer. I indict myself first with my earlier remarks. Barli, thank you for our comments. I wonder what it will take. How is it that an outbreak of the flu gets front page coverage for weeks on end, we are capable of finding a specific cow who started “mad cow” disease and yet autism continues to baffle? At what point will we say, okay this deserves legislation, this deserves our attention, this deserves funding – at what point are we going to recognize that we have large numbers of children who need our help? Insurance companies uniformly deny payment, almost all of the therapies, including speech are NOT covered by insurance companies. Some people still insist that autism is a behavioral problem or a psychological problem, when it is NOT! What will it take? I don’t have any answers, I wish I did. But sadly I don’t. I will keep writing about it though. I am not going to go away. I rember when my son was diagnosed ( he is now 11) I felt so alone. That this wasn’t very common and none knew what autism was. In a few short years I discovered there are many many children now being diagnosed. When my daughter regressed and was aloso diagnosed with autism I thought it rare to have 2 children on the spectrum. I have since met many families in the same situation. In my immediate neighbourhood of about 4 blocks there are at least 8 children with autism and 3 adults with apsergers. Our neighbor was recently diagnosed with aspergers. I don’t understand why people keep hiding from this reality. Where I live in Melbourne Australia and the Western part of Melbourne we have had a long battle to get the Education department to even COUNT the number of students who have autism. ( If a child attends a special school they are funded as having an intellectual disablity, if they attend a mainstream school they must have severe language delays to be funded as autistic- a diagnosis is not enough)It is easier when the problem is so big it seems, to just ignore it. Yesterday while with my two children in Central Park, here in New York city I met at least three other children with autism. Even my son Nic, who is after all only eleven, immediately said, “She’s autistic.” Later when I asked him how he knew, he said, “Mom, it’s easy. Just look at her.” And so we did. A little girl swinging on the monkey bars, same direction, over and over again, shouting the same words to no one in particular. Her father, looking somewhat concerned whenever another child approached. I completely identified. We are everywhere – the parents and so are they – our children.